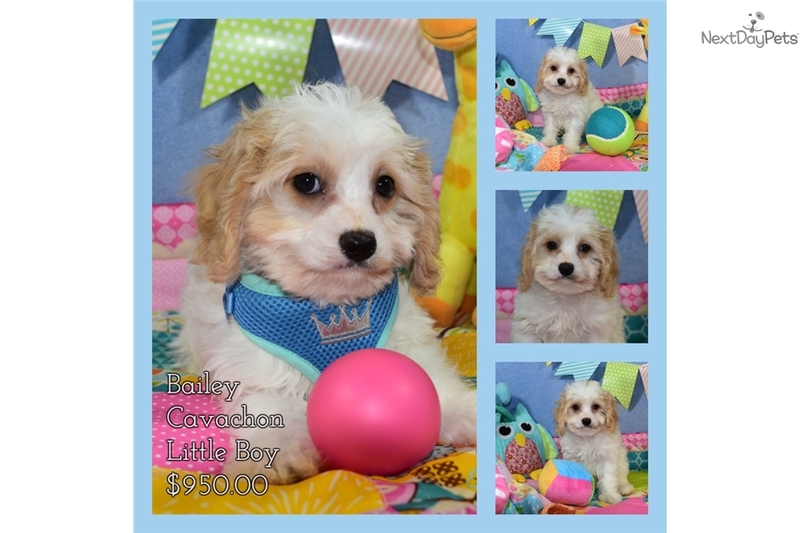 Bailey our beautiful Cavachon is ready & wagging! Puppies Ready in Virginia- Cava chon FOR SALE IN WASHINGTON DC, Virginia and Maryland homes Cavachons are stunning and are so popular and the perfect family puppy as they have become one of the most sought after breeds thanks to their reputation as the "forever puppy", and have the best temperaments you could ever ask of a new puppy. The Cavachon puppy are happy and love to play snuggle, cuddle and to play, Cavachons Puppy (s) are a simply perfect hybrid mix We provide a 5 year Health warranty, a lifetime return policy FREE Puppy Training and an invitation to our home for your puppy adoption, meet the parents and know and feel secure with your new puppy. All shots, immunizations, de-worming and 3 Vet cks and grooming done prior to your arrival. Please know your puppy vaccination record, and take home puppy pack care instructions are included along with expert care tips from the most reputable breeders and trainers in the country we have been famous for a healthy , happy puppy for decades and we love our puppy community. We have over 36 years of experience in puppy husbandry and are her to help to make your puppy adoption simply perfect and the to make your puppy’s transition to your family and lifetime home a pleasant and stress free one! We have an on call Vet for the first 30 days, a 5 year 100% money back Health warranty, a lifetime return policy and it all off your pup comes with a free training information and tips . Please visit us as we are well known, respected and a group of family breeders that have a stellar reputation for providing a well bred puppy from our family to yours with TLC.... You can visit us on YouTube, FaceBook, Pinterest and our website at www,DCDogfinders.com you can also get in touch with us through out direct email on our website or call 703-577-1069 See why CBS News and others named us the best place to get a puppy in Virginia, Maryland and DC... as we do not say we are the BEST our Customers do!